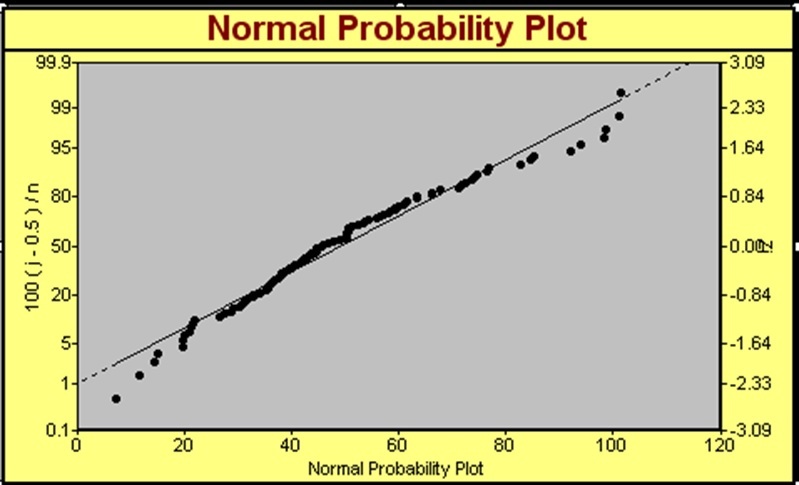 A Normal Probability Plot is a graphical tool used to visualize distributional assumptions. In this method, the sample data is plotted on special graph paper that is scaled according to the assumed distribution. If the data meets the conditions of the assumed Normal distribution curve, then the data will graph as a straight line. To construct a Normal Probability plot, rank order the data from the smallest value to the largest value. Assign probabilities to each value based on rank, the assumed distribution, and the number of samples. Draw a line of best fit through the center of data.